Sleek HDTV or aspirational branding gone mental? Right here is the latest Armani television, manufactured by Samsung, which has been unveiled at the Milan International Furniture Fair. Aside from the obvious question of 'why Armani? ', TechRadar cannot help but be mildly seduced by this 'fashion' HDTV’s sleek lines. The Armani/Samsung range will come in two models: 46- and 52-inch 1080p LCDs featuring Samsung's 100Hz motion processing tech. The aesthetic has been inspired by Giorgio Armani's latest '08/'09 Armani/Casa home furnishings collection. 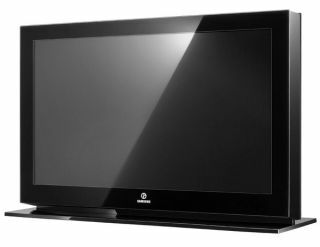 A glass panel sits over the screen and the TV has two remote controls, one with "radiant backlights", and a small pebble-shaped one to be used for basic functions. We never previously realised that you needed two TV remotes, but now we suddenly find ourselves wanting them. The Armani HDTV has also apparently been designed to be a central feature of the room, not hidden away in a corner – something that too many other TV designers try (and fail) to achieve. Yes, it’s aspirational fashion branding gone mad. Yes we want one. And no, Samsung hasn't yet confirmed the price, but rest assured it will be costly.